Perfect to use with a surplus of peppers, this tasty relish is great for making a multitude of dishes. 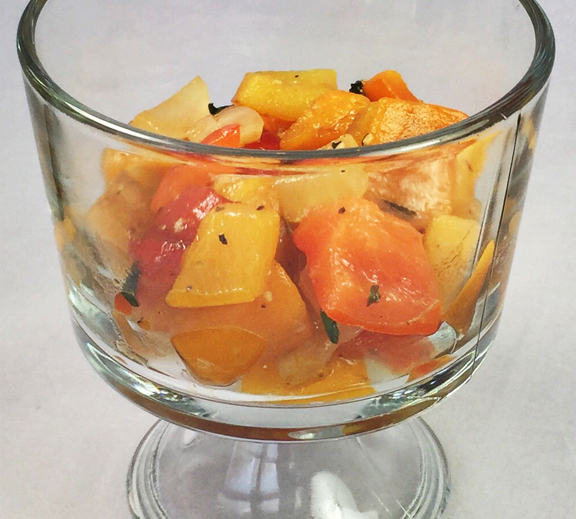 The peppers are grilled or roasted to bring out their sweetness, then combined with onions, fresh herbs, and vinegar to create a yummy relish. This relish is delicious with grilled meats, chicken or beef, toasted bread, tossed with cold pasta to make pasta salad, served over spiralized vegetables, cooked lentils or beans, or added to a grill cheese sandwich, or hot dogs! Preheat the oven to 450 degrees or prepare a barbecue grill to high. Cut the peppers in half, remove stem and seeds, and toss in 2 tablespoons of olive oil. Oven method – Line a baking sheet with parchment paper. Place the peppers, cut side down, on the sheet and roast for 25 minutes or until the skins are completely wrinkled and the peppers are charred. Rotate the baking sheet if necessary for them to cook evenly. Grill Method – Place the peppers, skin side down, on hot grill and cook until skin blisters, wrinkles and peppers soften about 5-8 minutes. Immediately place the peppers in a bowl and cover with plastic wrap to steam off the skins. Remove the skins and cut the peppers into ½” strips, then ½” squares. Heat the remaining one tablespoon of olive oil over medium heat. Add the onion and sauté for about 5-6 minutes until the onions are soft. Add the garlic, oregano, and a big pinch of salt then add the peppers and cook for 2-3 minutes until the peppers are just warmed through. Remove from the heat, stir in the balsamic vinegar and salt and pepper to taste. Cool completely and store in the refrigerator for up to one week. Serves 6. 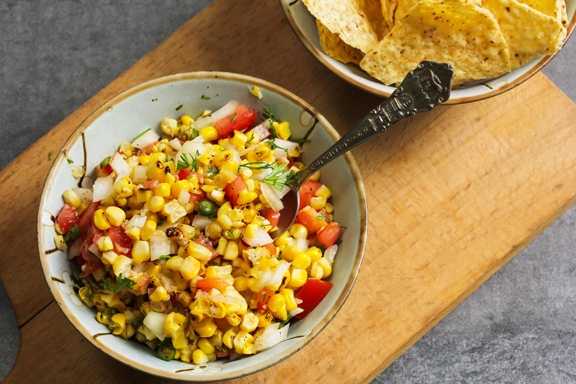 Roasting the corn and red pepper really delivers the flavor in this salsa. It’s perfect served with chips, as a condiment, or even over chili. Preheat the oven to 375 degrees. Toss the corn and peppers in 1 tablespoon of olive oil and 1 teaspoon of salt; spread on a sheet pan and roast for 20 minutes, stirring every 5 minutes. Cool slightly. Scrape the mixture into a bowl. Add in the cilantro and green onion. Stir in the remaining olive oil, the lime juice, and salt to taste.